The funeral service for Janet Hancock was held on Sabbath, August 14 at 4:00 p.m. in the Orofino Seventh-day Adventist Church in Orofino, Idaho, U.S.A. 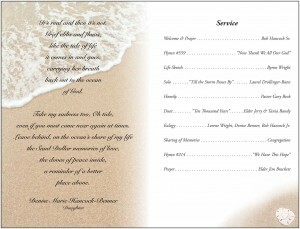 Here is an image of the outside and inside of the program. 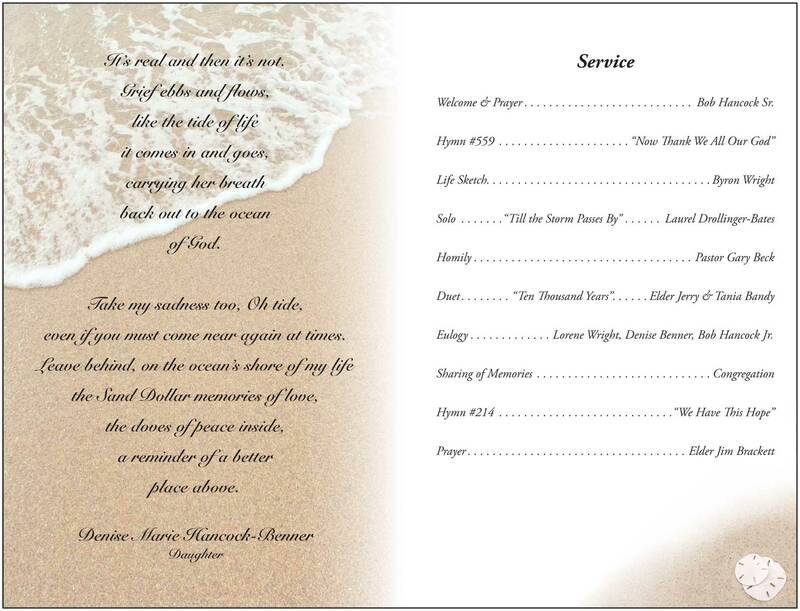 In the near future we plan to post a video of the service and the personal tributes that followed. This entry was posted on Monday, August 16th, 2010 at 7:41 am. You can follow any responses to this entry through the RSS 2.0 feed. You can leave a response, or trackback from your own site. About the time Janet and Bob arrived at Orofino to live on their ranch, Cyril and I moved to the area as well. Bob and his roommate Ed, Moon were with us at PUC 50 years ago. 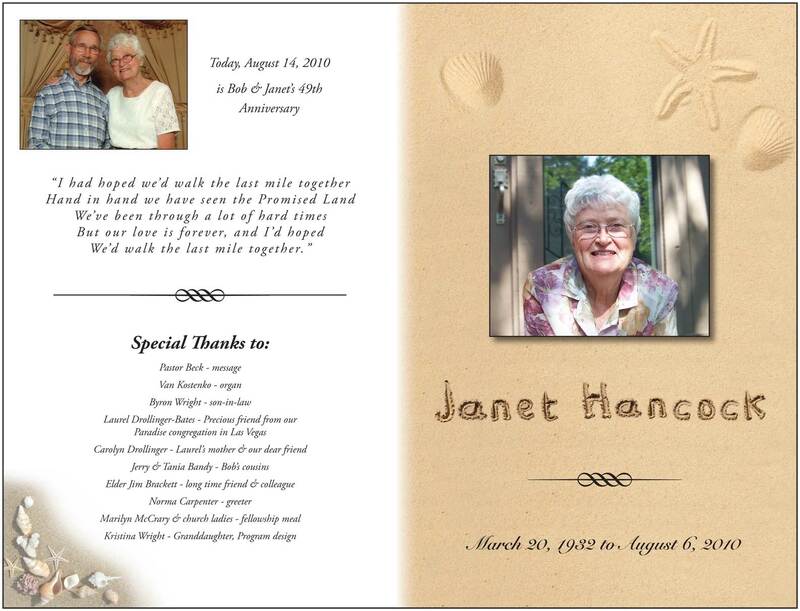 It was a pleasure to get acquainted with Janet. We thoroughly enjoyed what little time we were able to spend together and often delved deeply into spiritual matters. She was an elegant lady. You’ve done a formidable activity and our entire community will likely be thankful to you. add to my blog that automatically tweet my neewest twitter updates. some time and was hopinbg maybe you would haave some experience with something like this. Pleasse let me know if you run into anything. I tuly enjoy reading your blog and I look forward to your new updates. up very fast! What web host are you the usee of? Can I get your affiliate hyperlink in your host? Exactly where are your contact drtails though? Asking questions are actually good thing if you are not understanding something entirely, but this post provides pleasant understanding yet. on top of answering their questions. A new Interstate protocol could be needed to allow convoys to build in the left lane. Their outstanding customer relations generate a very happy moving experience. just wanted to say superbb blog! of a 1099 or W-2 wage statement. and post is actually fruitful in favor of me, keep up posting these posts. iż zacięcie się na nie przyniesie im wyrażoną dogodność. Stanowią gwałtownie cyniczne zaś skoro naturalnie owo mogę dotknąć – uparte. “https://adobe.com/” – Adobe Lightroom is the most wonted conspectus editing software with a view the gain photographers, with hundreds of thousands of effects and presets at the ready on the internet. “https://en.wikipedia.org/wiki/Adobe_Lightroom” – Adobe Lightroom presets help you to clean up your photos in register but by means of doing a assignment of the work after you. You can plainly test minus a pre-defined capacity, while keeping your source facsimile and reverting recoil from to it at anytime.